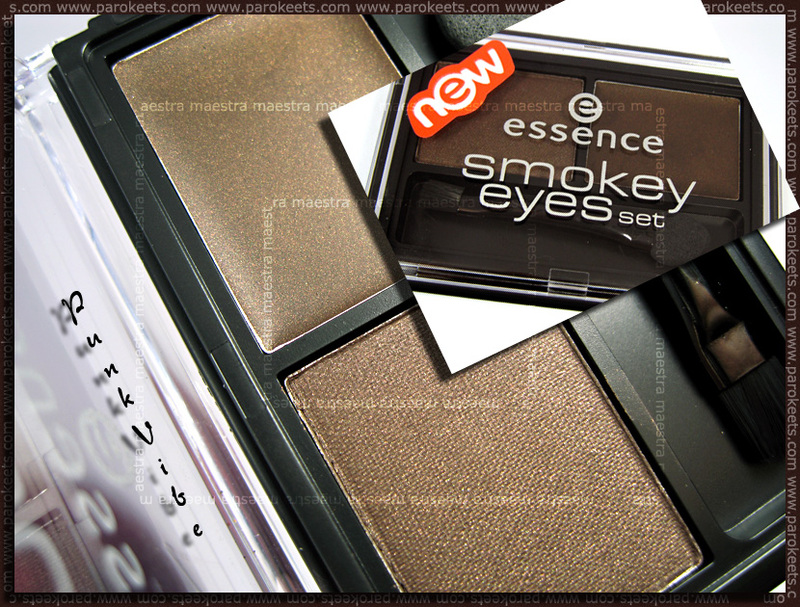 I’m really impressed by the Smokey Eyes Sets by Essence. There are two different sets. One is black and the other brown. I showed you swatches of both in THIS post. The set comes with a gel liner, eyeshadow and an applicator (sponge, brush). The packaging is OK. Not fancy but useful, robust and quite easy to handle. The eyeshadow is well pigmented, which I like very much. It’s soft, maybe at times to soft. The gel liner isn’t pigmented enough for me. It’s good to use it as a base, but not quite pigmented enough to use it as a liner. I can’t write anything about the applicator because I don’t use such applicators. I can’t remember the price, but as far as I remember these sets are worth every cent. I made a quick make up mainly with the Punk Vibe Smokey Eyes Set so you can see how it looks like on the eyelid. I also used The She Space eyeshadow (in the inner half of the eyelid; I can’t remember which shade I used) and some highlighter (also don’t know which one). I usually apply eyeshadows directly over a cream base, but this time I applied a neutral eyeshadow over cream base and then applied the Punk Vibe eyeshadow. I used this aproach manly because the Punk Vibe eyeshadow is dark and very well pigmented, but I didn’t want a very dark look. I was very clumsy at applying mascara. Sorry. Hope my review was useful. I would love to hear your thoughts about this product or some other products you like for smokey eyes. You have very beautiful eyes – the colour is amazing! .-= Gejba´s last post … OPI – Catch Me In Your Net =-. 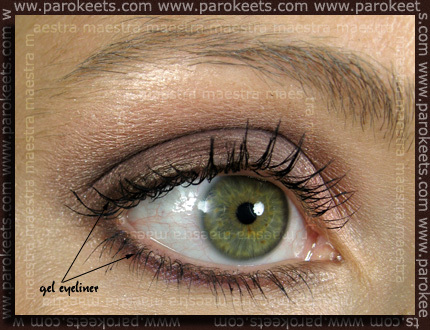 .-= Maestra´s last post … Review and swatches- Essence – Smokey Eyes Set – Punk Vibe quick EOTD =-.